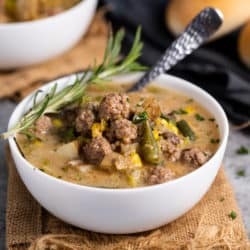 This ultra-comforting Hamburger Soup is made with simple staple ingredients and is easy to customize based on what you have on hand. It’s super flavorful and so easy to throw together. 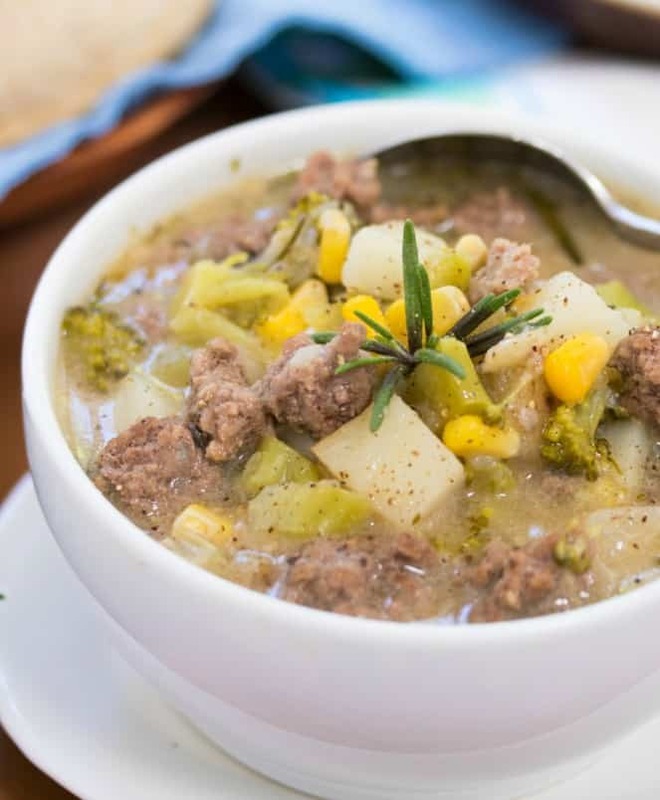 This hamburger soup is hands-down, one of my favorite soup recipes ever. I jokingly call this “Poor man’s soup” because my dad always talks about my grandmother making it when they had no money. Back then, I think they just used ground beef and water. I upgraded it to include chicken and beef broth, and I love tossing in a can or two of creamy soup (optional, but I like the flavor that it adds). Season uncooked ground beef with salt and pepper. 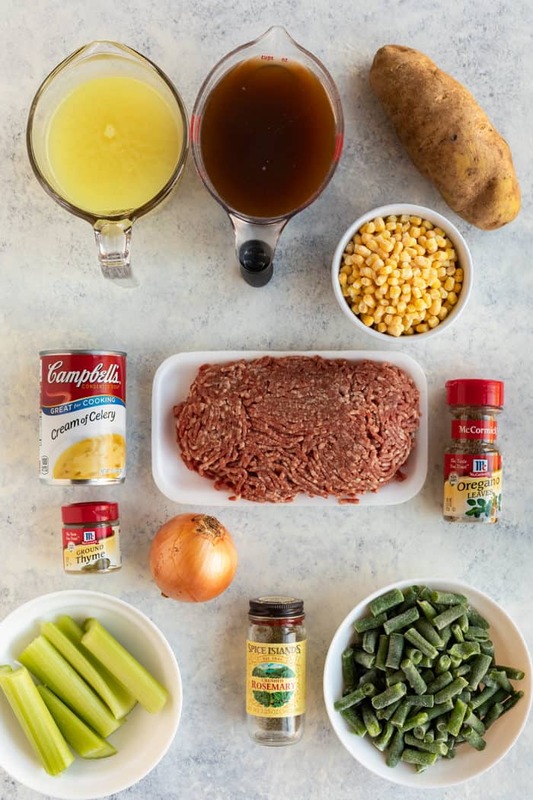 Add bite-sized pieces of the beef to a combination of beef broth, chicken broth, and water that is lightly boiling. Cooking the beef in the broth itself adds great flavor to the soup. From here, simply add your favorite vegetables to the soup. This can include green beans, corn, broccoli, carrots, onions, celery, potatoes, even canned diced tomatoes! For a hint of tomato flavor, add a Tablespoon of tomato paste. Season the soup with rosemary, thyme, and oregano. Feel free to toss in bay leaves if you have them. Let the soup simmer until the vegetables are nice and tender and cooked through. Personally, I love adding cans of creamy soups to the mix. I even add combinations of different soups like cream of celery, cream of broccoli, and broccoli cheese. It might seem odd but it actually tastes really good. -Take a leftover chicken carcass (even a small rotisserie chicken is great for this), and place the bones and all of the scraps into a medium/large pot. -Add enough water to cover the chicken by an inch or so. Add in any onions/celery if you have them. -Cover the pot, leaving a small crack for steam to escape and simmer for an hour or two. 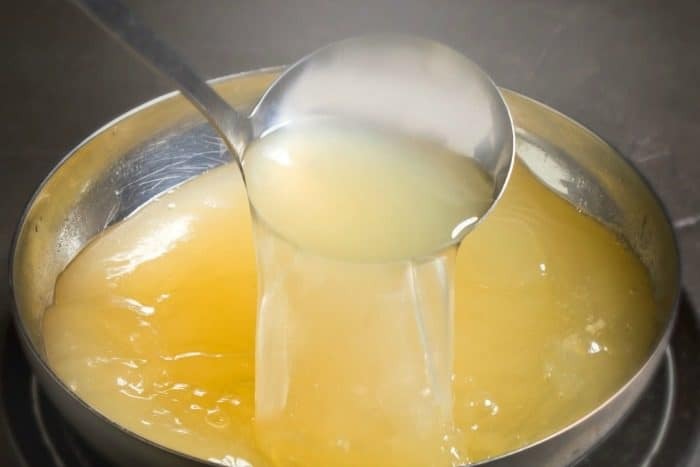 -Place a fine mesh strainer over another large pot and pour the mixture into the strainer, allowing the broth to seep through the strainer into the pot. The remains in the strainer can be discarded. -Allow the chicken broth to cool and freeze for your future soup needs! -Leftovers should be refrigerated and used within three days. -You can also freeze leftovers, and it’s best if you eat them within three months. If you aren’t on my free email list, you have to join! You’ll get just one weekly email with my latest recipes and nothing more than that! Plus, you’ve gotta follow me on Facebook, Pinterest, and Instagram too! Doooo it. 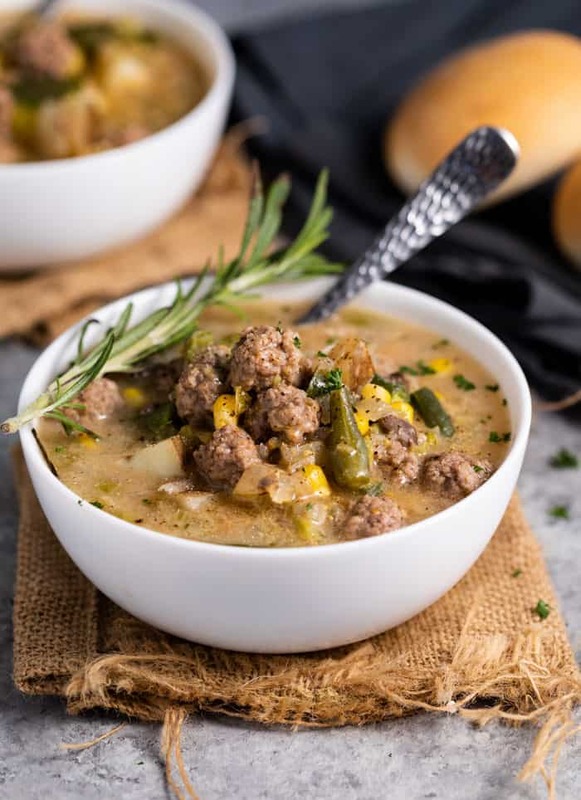 This ultra-comforting Hamburger Soup is made with simple staple ingredients and is easy to customize based on what you have on hand. It's super flavorful and so easy to throw together. In a large soup pot over medium heat, heat the water, chicken broth and beef broth, bringing it to a light boil. Season the (uncooked) ground beef with salt and pepper and drop bite sized balls into the broth. (You can roll them neatly or just break it into pieces and toss it in). Don't brown the beef before dropping into the soup. Add the diced potatoes, diced onions, diced celery, green beans, corn, and bay leaf. Heat the soup, partially covered, for about 25 minutes. Mix in the cream of celery soup and seasonings. Reduce the soup to a light simmer and heat for an additional 25 minutes, or until the potatoes and vegetables are soft and the meat is cooked through. Add any additional salt/pepper as needed & serve! *Cream of Mushroom or Cream of Chicken Soup may also be used. So delicious! This one is going in my book of recipes to keep! Use a sweet potatoe, red onion and cut French beans instead since that’s what we had and still delish! Hi Ryan! I am so curious how it turned out with venison! I hope you loved it! It turned out really well! Whole family loved it ! Great recipe!